Definitely a unusual event, but let’s see how it worked out. The order of the Gauntlet Match was decided by raffle and they will be wrestling in the order that I have listed above in the match list. So Diemond and Watanabe will start, then the winner will face Yoneyama, and so on. There is a ten minute time limit so if two wrestlers draw, both are eliminated and the next two wrestlers face off. 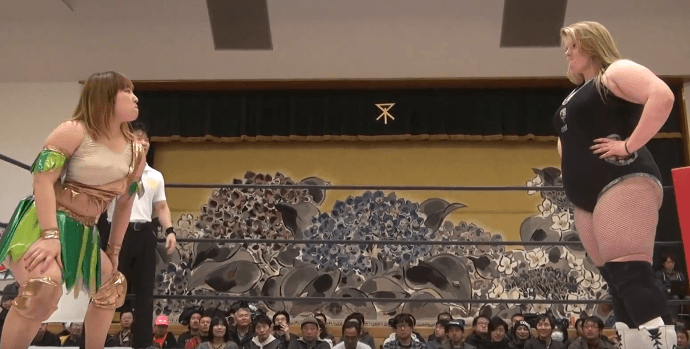 We kick off the Gauntlet with a wrestler from Oedo Tai vs. one of the Stardom youngsters. Diemond won’t shake Watanabe’s hand before the match, Watanabe hits a dropkick but Diemond shrugs off the second and catapults Watanabe into the bottom rope. Diemond hits a backbreaker, Yasukawa gets on the apron and together they attack Watanabe. Back in the ring, suplex by Diemond and she covers Watanabe for two. Watanabe snakes in a small package but Diemond levels her with a lariat. Watanabe tries to elbow Diemond away but she flings the kid to the mat, jawbreaker by Watanabe and she dropkicks Diemond until the corner. Another dropkick by Watanabe, she elbows Diemond but Diemond snaps off a DDT for a two count. Quick roll-up by Watanabe and she dropkicks Diemond, Watanabe goes up to the second turnbuckle and she hits a missile dropkick for two. She goes for the Somato but Diemond avoids it, lariat by Diemond and she nails the Body Crusher for the three count! Diemond wins the match and moves on in the Gauntlet. The veteran Yoneyama attacks Diemond as soon as she gets in the ring, they go back and forth with Yoneyama knocking Diemond to the mat first. Diemond recovers as she gets Yoneyama on the apron and Yasukawa assists with attacking her, Diemond charges them but Yoneyama moves and dropkicks Diemond into Yasukawa. The action spills to the floor as Yoneyama hits them both with a bottle, but Yasukawa recovers and helps Diemond take back over the match. They return to the ring, backbreaker by Diemond and she cover Yoneyama for two. Diemond throws Yoneyama into the corner and hits a lariat, hard elbow by Diemond but Yoneyama avoids her in the corner, Yoneyama goes for a crossbody but Diemond catches her and slams her to the mat. Yoneyama bridges out of the pin, chops to the throat by Yoneyama and she hits a running senton for two. Yoneyama gets on the second turnbuckle and delivers a diving senton, cover by Yoneyama but Diemond gets a shoulder up. Yoneyama goes all the way up this time but Diemond recovers and puts Yoneyama on her shoulders. Samoan Drop by Diemond and she hits a short range lariat, she covers Yoneyama but it gets two. She goes for the Body Crusher but Yoneyama blocks it, backslide by Yoneyama but Diemond kicks out. Diemond shrugs off Yoneyama and boots her in the face, side slam by Diemond and she covers Yoneyama for a two count. Armtrap Crossface by Diemond, but Yoneyama eventually gets to the ropes to force a break. Diemond picks up Yoneyama and hits a DDT, Yoneyama quickly puts Diemond in an inside cradle but the bell rings and the time has expired. The match is a Draw and both wrestlers are eliminated. We get two fresh wrestlers in, as the Scottish wrestler Viper takes on the much smaller Stardom rookie. Mimura is feisty but ineffective to start, Viper gets on her knees to give Mimura a break but Viper still applies a wristlock. Viper picks up Mimura but she slides away, running crossbody by Mimura but it gets barely two. Dropkick by Mimura but Viper blocks the suplex attempt and slams Mimura to the mat. Viper chokes Mimura and throws her in the corner, body slam by Viper and she covers Mimura for a two count. Diemond and Yasukawa get on the apron and Mimura is triple teamed but Yasukawa kicks Viper by accident, Mimura goes for La Magistral but Viper blocks it and rams Mimura into the corner. Mimura elbows Viper and slams her again, crab hold by Viper and Mimura gives up! Viper continues in the Gauntlet Match. This is the final pairing, as the monster Viper takes on another Stardom rookie, this time young Kyouna. Kyouna goes at Viper to start with little luck, she applies a sleeper but Viper gets out of it and throws Kyouna in the corner. Kyouna avoids Viper’s charge and hits a body avalanche in the corner, Lariat to the back of the head and Kyouna puts Viper in a Camel Clutch. Viper quickly gets out of it and slams Kyouna in the corner, body avalanche by Viper and she covers Kyouna for two. Viper chokes Kyouna with her boot and puts her in a submission, Kyouna gets out of it but Viper knocks her back to the mat. Kyouna slides away and hits a chop block, lariat by Kyouna and she covers Viper for a two count. Kyouna goes for a cross armbreaker and gets it applied, but Viper gets into the ropes to force a break. Mounted elbows by Kyouna, she goes up top but Viper grabs her and flings Kyouna to the mat. Kyouna avoids the running senton and applies a schoolboy, but it gets two. Kyouna lariats Viper but Viper lariats her back, crab hold by Viper but Kyouna gets to the ropes. Viper gets on the second turnbuckle and nails the Reverse Splash, cover by Viper and she gets the three count! Viper wins the Gauntlet Match! I was a bit disappointed with this. A Gauntlet Match is a great way to get a rookie or young wrestler over, but they opted not to do that here. Even though Kyouna got Viper after she had wrestled one match, she still was defeated in under seven minutes anyway. Not saying Kyouna should be pinning Viper, but the order could have been re-arranged to highlight one of the younger wrestlers a bit as all three were defeated in relatively short order. The action itself was fine, Diemond in particular looked really good, but it just seems like they didn’t take advantage of the match structure to do something memorable. This match is for the Artist of Stardom Championship. The Hyper Destroyers won the titles on December 6th in a triple threat match, and one of the teams they beat was Shirai, Iwatani, and Watanabe. So Shirai and Iwatani (the tag team champions) went and found themselves a better partner and are back to try to win the titles again. 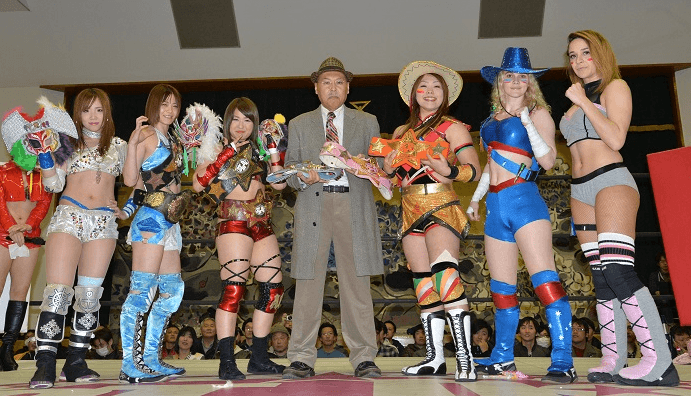 This is The Hyper Destroyers’ third title defense, they last defended the belts on January 24th against Oedo Tai. Normally the Artist of Stardom Championship is a bit more playful than the other titles, but Shirai and team are a bit serious so we will see how it goes. Shirai and Matsumoto kick things off, they trade holds until Matsomoto avoids Shirai’s dropkick and hits a double knee drop. Shirai knocks Matsumoto down and hits a quick standing moonsault, and they both tag out as Iwatani and Skater enter the ring. They go back and forth with armdrags and quick pin attempts with neither getting an advantage, Skater’s teammates run in and they triple team Iwatani. Hojo comes in too and they both chop Skater, dropkick by Iwatani and with Shirai they all pose on top of Skater. Iwatani puts Skater in a camel clutch and she tortures her a bit before tagging Shirai. Shirai blows a streamer toy into Skater’s mouth before tagging Hojo, chop by Hojo to Skater and she covers her for two. Iwatani comes into the match but Skater drops her with a springboard elbow and tags in Matsumoto. Matsumoto takes care of all three of her opponents, she stacks them on top of each other and puts them all in a triple crab hold with Skater’s help. Matsumoto lays Iwatani across the ropes in the corner and hits a body avalanche, cover by Matsumoto but it gets two. Evie is tagged in, kicks by Evie and Skater is in next and she slams Iwatani before dropping a leg on her. Skater throws Iwatani into the corner but Iwatani avoids her charge and tags in Shirai. Matsumoto comes in too as does Evie and Hojo, but Iwatani missile dropkicks everyone over. Catapult elbow smash by Hojo to Skater in the corner, then Shirai hits a running double knee for a two count. Shirai goes for the double underhook but Skater gets out of it and hits a superkick. She tags Matsumoto, she trades elbows with Shirai before decking her with a sliding lariat. Matsumoto picks up Shirai, Shirai goes for a hurricanrana but Matsumoto catches her and applies a crab hold. Matsumoto goes to the second turnbuckle and hits a reverse double knee splash, but Iwatani breaks up the cover. Matsumoto goes for a backdrop suplex but Shirai lands on her feet, Matsumoto snaps Shirai’s neck over the top rope but Matsumoto is grabbed from the apron. Shirai goes for a baseball slide but hits Hojo by accident and the wrestlers tumble out of the ring. Iwatani goes up top and hits a diving crossbody to the floor onto Matsumoto and Skater, Shirai slides Matsumoto back in the ring and hits a swandive missile dropkick. Another dropkick by Shirai and she covers Matsumoto for two. Shirai tags Hojo and she hits a diving elbow smash, but Skater breaks up the cover. Hojo chops Matsumoto but Matsumoto hits a shoulderblock. Big spear by Hojo and she hits a footstomp, she goes up top but Skater runs in and elbows her. Matsumoto goes up top with Hojo and hits a superplex, Matsumoto tags in Evie and Evie kicks Hojo in the back before covering her for two. She tags Skater and Skater throws Hojo into the corner before Evie hits a big boot. Buzzsaw kick by Skater and she hits a front flip neckbreaker on Hojo for a two count. Iwatani comes in and dropkicks Skater, Shirai comes in but Matsumoto crushes her with a lariat. Hojo and Skater trade strikes, high kick by Skater but she eats a triple dropkick. Spike Piledriver to Skater, but Matsumoto breaks up the pinfall. Hojo picks up Skater and goes for a Sliding D, but Skater reverses it into a crucifix pin for two. Matsumoto and Evie come in with streamer guns, but Hojo ducks and they all end up shooting each other. Spear Dropkick by Iwatani in the corner on Skater, Hojo then goes up top and she nails the Diving Elbow Drop. Cover by Hojo, and she gets the three count! Hojo, Iwatani, and Shirai are your new champions! This was definitely a one match card. The Gauntlet match as a whole was a bit disappointing, but some of the sections of it like Diamond/Yoneyama and Kyouna/Viper had a lot of good aspects. The main event was great though, one of the best six woman tag matches that I have seen in awhile. 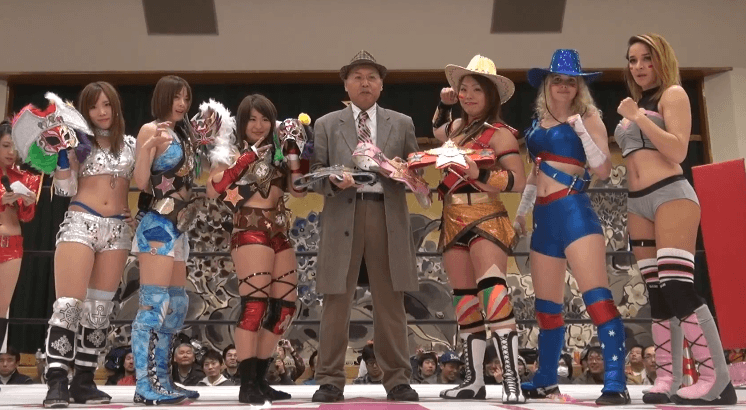 Remember these matches can be seen right now over at Stardom World, which I link to at the top of the review, definitely worth the $5 a month.